getcalc.com's Annuity Calculator is an online finance tool to calculate the periodical annuity payment during accumulation period that generates the regular periodic payments in the future, generally after retirement, for a specific long period of time. Annuity is a finance function or method used in the context of time value of money calculation, often abbreviated as A, represents the series of regular payments at a fixed interval for a specific period of time that generally provide steady income for rest of lifetime after retirement or for long period of time at a certain interval, generally in monthly, quarterly, yearly intervals or in lump sum in the finance industry. It has two phases that they are Accumulation phase and annuitization phase. The accumulation phase is the period before payout begins and annuity is being funded. 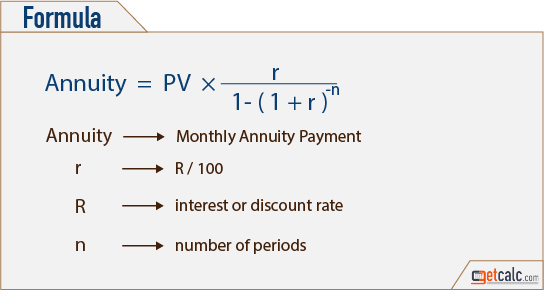 The annuitization phase is the payout period starts after the accumulation period.